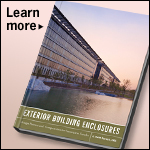 Written by the technical director of the San Francisco office of Skidmore, Owings & Merrill, Exterior Building Enclosures is an indispensable resource for architects, engineers, facade consultants, and green design consultants working on commercial building projects. 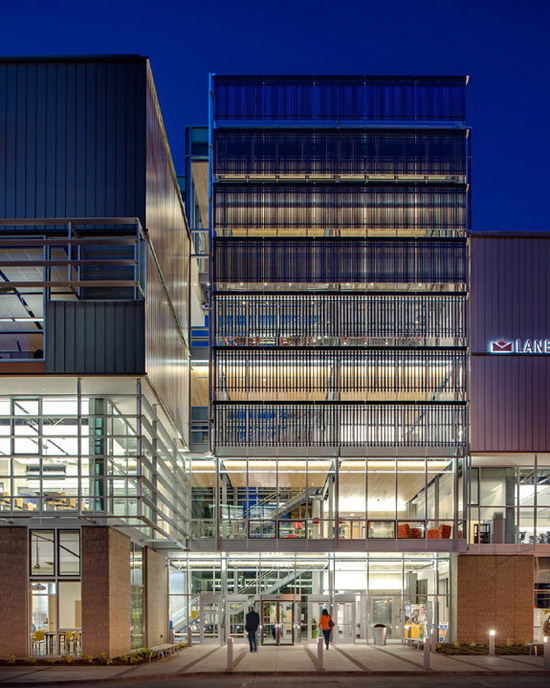 Approaching the new Lane Community College (LCC) Downtown Center in Eugene, Oregon, you're greeted by a huge planar screen of vertical glass tubes suspended above the building entrance, partially shading the glazed southern facade of its atrium. The screen is a thermal collector array for the center's domestic hot water system, hinting that the new campus satellite, including academic and student housing buildings, was created with a focus on sustainability. The 182,000-square-foot (17,000-square-meter) Downtown Center was built on a long-vacant prime lot in Eugene's city core, directly opposite the recent Eugene Public Library (2003), and with the city's primary bus transit center on the diagonal block to the southeast. SRG Partnership designed the new campus, with Robertson Sherwood Architects acting as architect of record, and Pyatok Architects as apartment design consultants. Construction of the new facility was made possible in part by an apparent sweetheart deal between the college and the City of Eugene, which parted with the site — valued around one million dollars — for just one dollar. The center's program is divided on its half-block site between two L-shaped buildings that mirror each other to define a rectangular courtyard space at the center of the site. 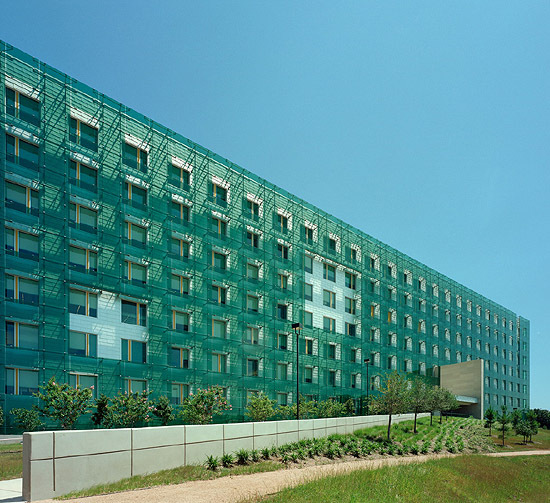 Although these buildings are connected at several points and share a common palette of neutral panels with occasional highlights of orange and green, their individual scale and detailing distinguish one from the other. 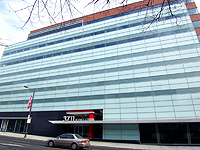 The southeastern building, with frontages on two streets, contains the center's academic functions, including classrooms, offices, laboratories and event spaces. And its L-shaped plan is staggered near the street corner to make room for a small public plaza leading to the building's atrium. It is possible to design buildings that can reasonably be expected not to kill birds. Numerous examples of this kind exist. These are not necessarily designed with birds in mind, but to be functional and attractive. 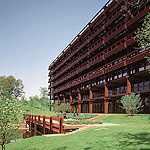 These buildings usually have windows, but may use screens, latticework, grilles, and other devices outside the glass or integrated into the glass. Designing a new structure to be bird friendly does not need to restrict the imagination or add to the cost of construction. Architects around the globe have created fascinating and important structures that incorporate little or no exposed glass. In some cases, inspiration has been born out of functional needs, such as shading in hot climates, in others, aesthetics. Being bird-friendly was usually incidental. Retrofitting existing buildings can often be done by targeting problem areas, rather than entire buildings. Finding glass treatments that can eliminate or greatly reduce bird mortality while minimally obscuring the glass itself has been the goal of several researchers, including Martin Rössler, Dan Klem, and Christine Sheppard. Their research has focused primarily on the spacing, width, and orientation of lines marked on glass, and has shown that patterns covering as little as 5% of the total glass surface can deter 90% of strikes under experimental conditions. This research has consistently shown that most birds will not attempt to fly through horizontal spaces less than 2 inches (5 centimeters) high nor through vertical spaces 4 inches (10 centimeters) wide or smaller. 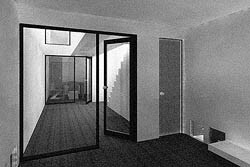 Acid-etched glass creates a translucent satin appearance which obscures views while maintaining a high level of light transmittance. Walker Textures™ glass is not only suitable for interiors but can be readily used in exterior applications as well. This versatile translucent substrate is ideal because it reduces glare, diffuses light, creates depth and provides privacy. 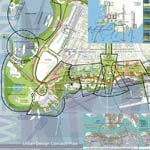 Before you even open SketchUp, you need to understand the core concepts that make it unique. First, SketchUp is a surface modeler that is unlike most 3D modeling programs. Everything in SketchUp is composed of edges and surfaces, the basic building blocks used in SketchUp. 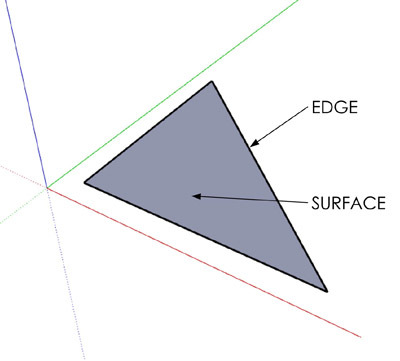 A surface cannot exist without a closed loop of coplanar edges, and the simplest surface possible is a triangle. Second, because it is a surface modeler, there are no true, perfect vector curves, arcs, or circles in SketchUp. However, you can still represent circles and curves with a series of small edges. Third, SketchUp geometry has a tendency to stick together. This concept is known as the "stickiness of geometry" in SketchUp. Adjoining surfaces stick together and move with each other. Connected endpoints will move with each other and stretch their corresponding lines. Even though this can be frustrating at first, once you learn to control the stickiness, you will realize how much it speeds up the modeling process. Fourth, geometry does not stack in SketchUp. Only one edge or surface can exist between the same series of points. Even when multiple edges are drawn on top of each other, the edges simply combine into one. 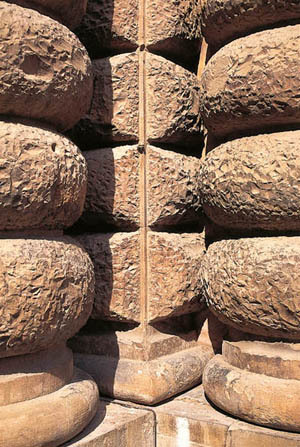 When an edge is drawn that intersects or overlaps an existing edge, the existing edge will be broken into two pieces. Lastly, the inference engine is the "brain" in SketchUp that is always working for you; it is what assumes meaningful relationships between points, edges, and surfaces. Although you can't turn off the inference engine, you can control it through the power of suggestion. There are several inferences available in SketchUp. "Reinvention of the loved and loathed Grade II* listed 1960s housing estate. The structure of the building remained in place whilst key features were changed – interior layout, windows, security and much more. It stands as a beacon for imaginative regeneration, quality mass housing and the bold reuse of a listed building." "The radical re-thinking of the shape and interior of the UK house is tackled masterfully with these 84 new homes in suburban Essex that clearly illustrate that good design quality and committed developers can transform peoples' lives. A new model for British housing?" "An uplifting spiritual space of great potency that the client has described as 'what we dreamed of but didn't think we would get'. An incredible showcase for modern British craftsmanship." "Beautiful contemporary Landmark Trust holiday home installed in the ruined walls of a 12th century manor. 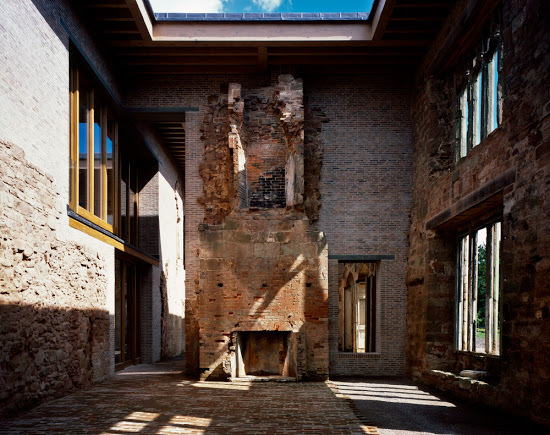 Unique example of the recovery of an ancient building – it is a prototype for a bold new attitude to restoration and reuse." "Breaks the mould of the traditional visitor centre that tends to hide from the limelight or make a statement, this highly imaginative and sculptural piece of 'land art' offers visitors an experience that is physical and interactive, like the causeway itself. Having 'tuned in' so perfectly to the environment, the visitor centre acts as the perfect prologue for the main event." "Exceptional example of how to create a vibrant new public space through the careful design and placement of buildings. High-quality, beautiful and dramatic buildings that punch far above their rock-bottom budget." 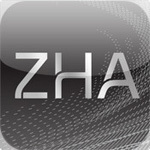 The official app of Zaha Hadid Architects is available for iOS (iPhone and iPad versions). This free app allows users to browse through the practice's current portfolio of design and architecture. 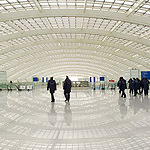 The app will also offer users interactive guides to be used when visiting several of the firm's award-winning projects. 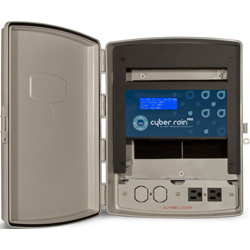 Cyber Rain is a sprinkler controller with a brain and the Cyber Rain Long Range Controller connects to your sprinkler valves and replaces a traditional timer. After installation, it is fully controlled from your computer or smart phone. Cyber Rain software uses the internet to check the weather and sends updated irrigation schedules to the field controllers over a wireless network. The controllers report back all on irrigation activity, current/valve failures, and water savings. Controllers are available in 8, 16 and 24 zones models and in networked and USB versions. "I love buildings. 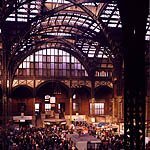 Great buildings are works of art." This material's proponents claim that it is harder than walnut and more stable than oak. Technically a grass, the product has come into use as a substitute for tongue-and-groove hardwood flooring. What material am I referring to? When early American townships were being developed, it was common to offer lots of various lengths along street frontages. Depending on a person’s inclinations or financial strength they might purchase a lot of 1, 2, 3, or 4 rods wide. How wide is a 4-rod lot? "This one-bedroom, one-bathroom house in Osaka, Japan was built on a very narrow lot in a core urban rowhouse neighborhood. Its unassuming and slightly austere concrete form belies a poetically composed interior, emphasizing functionality and privacy. "Measuring a mere 10.5 feet (3.2 meters) wide and 42 feet (12.8 meters) long, this house provides about 700 square feet (65 square meters) of living space on a 615-square-foot (57-square-meter) lot. "Only the living room is connected to the public street, by way of an inset stoop. A central courtyard is at the heart of this house, buffering the other spaces from the outside world, while providing all with access to light and air. In addition to living room and courtyard, the ground floor contains all the service spaces (kitchen/ dining room and bathroom), which are clustered in the rear one-third of the house. "A narrow stair and bridge lead to the upstairs bedroom and study, which lie on either end of the courtyard. subscribers and hundreds of thousands of monthly visitors. Great thanks to all our sustaining and group subscribers! Your special support of ArchitectureWeek is vital & appreciated. Click Forward in your email — Share ArchWeek Notes with a friend!